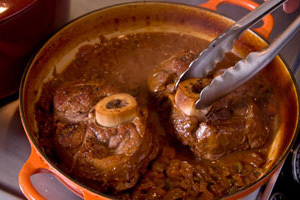 Try using these recipes along with basic braising techniques to braise your favorite roasts, ribs, osso bucco and more! v. Reduce liquid by half to three-quarters, or until the liquid is thick. vi. 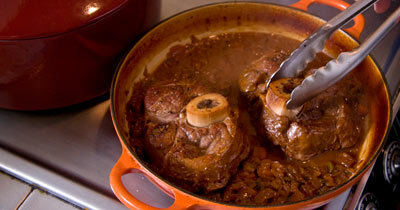 Once the braising liquid is thick, return osso bucco to pan. 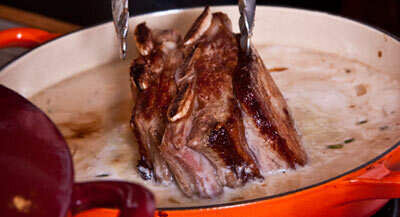 Rub the osso bucco in the liquid, then flip it over, rub the other side in the liquid and let sit. vii. Add simmering stock to the braising pan. Add enough stock to cover meat half-way or you can cover the meat completely, depending on how much liquid you want in the final dish. ii. Sweat the vegetables, but do not caramelize. i. Add 1.5 cups mire poix and 2 minced cloves garlic. Brown slightly. v. Reduce to cook down the tomatoes and until the liquid thickens a bit. i. Add ½ cup onion and 3 tablespoons each of garlic, jalapeno and ginger. Sweat.